Most historic structures include a variety of wooden structural and decorative elements from windows and doors to roofs and framing systems. Conservators apply an approach that seeks to preserve original material wherever possible and, as necessary, create replacement elements to complement the old. To view our awards in historic preservation click here. 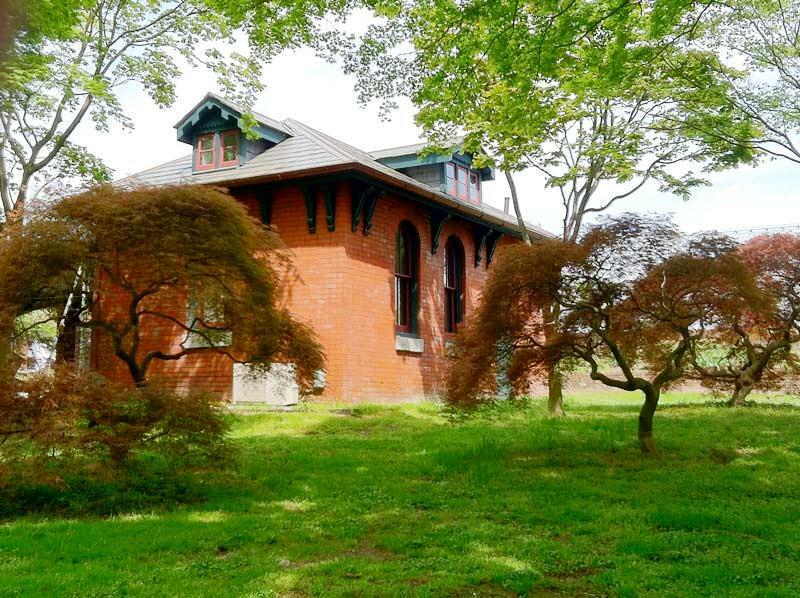 Originally built as restroom facilities for the 1876 Centennial Exhibition in Philadelphia, the two Centennial Comfort Stations are located to the south of the Horticultural Hall Complex in West Fairmount Park. Both buildings are similar in construction and plan, constructed of brick with unique small mortar joints or “butter” joints, with wooden exterior elements, slate roofs and copper detailing. The project includes the restoration of historic windows, consolidation and epoxy filling of door and window jambs, the conservation and replication of original exterior woodwork where needed, and the installation of salvaged exterior doors. For replicated crown molding, the Conservancy used thermally treated poplar wood. Poplar, which is traditionally unsuitable for exterior wood but easily available locally, becomes more water and decay resistant when treated with gradual heat.